“My wife, Dee, is only 63 and has early-onset dementia. I was finding it increasingly hard to understand her dementia and meet her needs. I was desperate for help and felt very alone. I found the Dementia Support Centre via the internet. We called in to see them and we were warmly welcomed by the staff and shown round where we could see various groups of activities ranging from baking to arts and crafts and a lovely reminiscence group that Dee joined in. It was heart-warming to see her interact after such a long time. The staff displayed patience and kindness and the room had a lovely atmosphere and everyone looked so relaxed and happy. From the very first meeting, I felt like somebody cared and understood how I felt. Dee now goes to the centre three days a week and I have my life back again… I do not feel isolated as I did before. With time to myself, I feel that my batteries are recharged to face the challenges that Dee’s dementia brings. I have re-joined my bowls club, which I had to give up over a year ago. 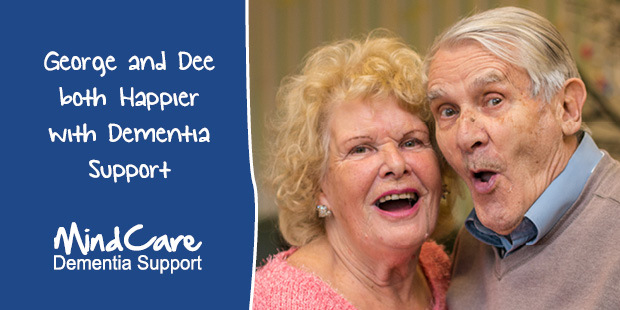 ‘George’ and ‘Dee’ both benefited from using MindCare Dementia Support Centres in Bromley. MindCare Dementia Support helps people with dementia to remain in their own homes and local communities, enjoying the best possible quality of life. Some of our clients live on their own; others are cared for by family carers who, in turn, rely on MindCare services for advice and respite from the demands of being on call 24 hours a day, seven days a week. MindCare Dementia Support Centres in Bromley provided support to a total of 221 clients from April 2016 to March 2017. Individual Support Plans are reviewed and refreshed throughout the year to give clients roles and tasks to recover or maintain life skills and boost self-esteem. Alongside other activities that stimulate memory and improve physical health, this ensures our clients enjoy a varied and fulfilling day whilst giving family carers a break. making further improvements to the physical environment of the centres. In addition to the Dementia Support Centres, MindCare’s Dementia Exercise and Wellbeing Café, which includes a gentle exercise session, met fortnightly during the year at Venue 28 in Beckenham. The café grew in popularity during the year, with an average of 14 people with dementia and their carers attending each session. MindCare Dementia Support is part of Bromley & Lewisham Mind. Find out more about Bromley & Lewisham Mind services in the Annual Review 2017.